They don’t even look like Hello Kitty. Why are they wearing masks? Even if they were to get a divorce or were seperated, it doesn’t seem too significant as to where you can’t pull it off as a solo tattoo. 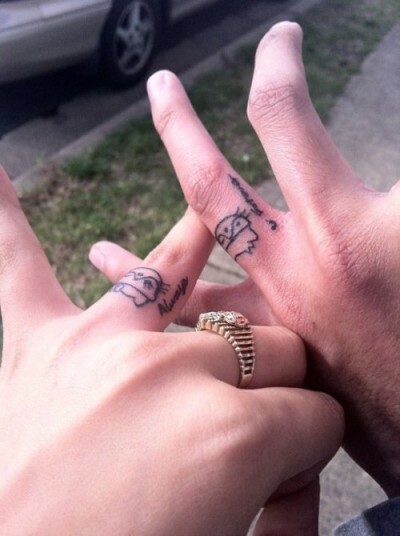 I think the fact that they got it together is cute but as for the tattoo itself…i can’t really say i like it. It’s plain and it doesn’t even seem HKish to me. That’s just my opinion of course. If they like it then good for them. Thank god for Dr. Zizmor! What’s wrong with you?! What do you have against love?! These two people are in love and everyone knows that love is Hello Kitty and everyone want to be with Hello Kitty for eternity. Only you can’t see that! It’s no wonder you’re so bitter. Your heart must look like a shriveled raisin. Stop telling us your stupid and petty opinions. You just show what a horrible person you are and nobody cares! Bad finger tattoos are bad. Darlene love isn’t Hello Kitty. If love were signified by something as basic, commercial and overrated as a cartoon cat this would be a sad place indeed. These tattoos could be worse, though. These seem more loke HK-based portraits of the two getting married, which to me doesn’t seem quite as inexcuseable. Doesn’t seem like the best decision to me, though. I thought finger tattoo was.. gansta or a prison thing. Nice idea but I would not do it. Good luck though- it’s hard making a marriage work nowadays, so I hope you two do make it! Doomed. This couple is doomed. different stokes for different folks ey? we did it ! so screw all those who doubted us!!!!!!! were still together. 5 years strong. high school sweetheart.